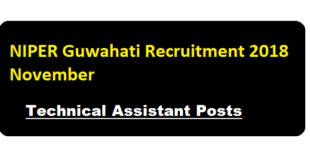 NIPER Guwahati has published a recruitment notification in the month of November 2018. NIPER-Guwahati is the fifth Institute to be included in the list of premier Institutes under the Department of Pharmaceuticals, Ministry of Chemicals & Fertilizers, Govt. of India. According to the latest recruitment of NIPER Guwahati 2018 a Walk-in-Interview will be held on 15.12.2018 (Saturday) to fill up the following Non-Teaching positions on contract basis for the projects funded by Govt. of India/Institute. 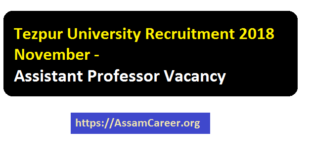 Tezpur University has published a recruitment notification in the month of November 2018 fir filling up the post of Assistant Professor. According to the latest Tezpur University Recruitment 2018 November, Tezpur University is looking for an Assistant Professor (Mass Communication) for the Centre for Open and Distance Learning (CODL) on contract basis initially for eleven (11) months . Recruitment of Defence Civilian - HQ 22 Movement Control Group, Guwahati 2018 :- Applications are invited from eligible Indian Nationals for the following Posts; as per format given below on plain paper. Controller of Defence Accounts Narangi Guwahati has published a recruitment notification in the month of October 2018. The CDA Guwahati is in the process of filling up vacant posts in the grade of Canteen Attendant in the Departmental Canteen of this Department. Applications are invited on direct recruitment basis as given in the following section. Marwari Hospitals ,Guwahati has issued a recruitment notification in the month of October 2018 for various positions. 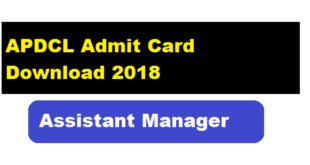 Applications are invited for Marwari Hospitals ,Guwahati Recruitment 2018 f for the post of ICU Technician, Technician, Sr. & Jr Resident Doctor and more. The details of the vacancy can be found below sections. Applications are hereby invited in standard form of application (Assam Gazette Part-IX from the Retired Govt. (Grade-III) persons to be engaged as Senior Assistant in Circle Project Management Unit of NRC Updation Project in the Office of the Circle Officer, Golaghat Revenue Circle. The post shall be on Contractual Basis @ 12000.00 (Rupees Twelve Thousand) per month. Guwahati Medical College has issued a recruitment notification in the month of October 2018 .Applications are invited for filling up Research Scientist (Non-Medical) posts at Gauhati Medical College & Hospital (GMCH) . The following position shall be filled purely on temporary basis through walk-in-interview under a ICMR & DHR, project of Govt. of India, in the Department of Microbiology, Gauhati Medical College, Guwahati-32 (Assam).